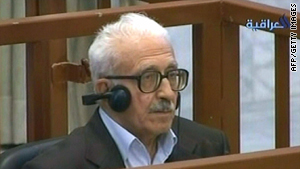 In this image taken from al-Iraqiya Television station on April 29, 2008, Tareq Aziz sits in the dock in a location in Iraq. Baghdad, Iraq (CNN) -- Tariq Aziz, a top lieutenant of executed Iraqi dictator Saddam Hussein, remained hospitalized at a U.S. military hospital Sunday after falling ill in prison, the U.S. command in Iraq reported. He was taken to the hospital Thursday, though no details of his ailment were released. But 1st Lt. Elizabeth Feste, a U.S. military spokeswoman, told CNN his condition was improving and he was being closely monitored. Aziz was one of the best-known faces of Hussein's government, serving as deputy prime minister from 1981 to 2003 and as foreign minister for part of that time. In March 2009, he was sentenced to 15 years in prison in connection with the 1992 executions of 42 merchants. He was captured by U.S. forces in April 2003, shortly after the U.S.-led invasion that toppled the Hussein. CNN's Mohammed Tawfeeq contributed to this report.